Thanks to Gamers Gate for the review copy! 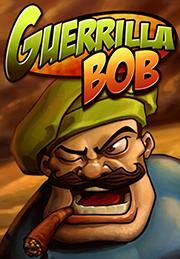 Guerrilla Bob is on a mission for revenge, and he's serving it on the business end of a smoking chain-gun. That's really all you need to know. But where the top-down shooter is light on story, it's heavy on action, putting players in the shoes of a cigar chomping, gun toting macho man. The running and gunning takes place over seven missions across the Middle East as you fight through wave after wave of enemies leading up to the final confrontation. Luckily, the controls are tight and the auto-aim does a good job of getting your endless supply of bullets to the closest enemy. Strong Points: Great art design and visual effects; variety of gameplay modes. Weak Points: Repetitive level design. The game has three different ways to play: Arcade, Mercenary and Survival, and each come in two difficulties. I had the most fun with Mercenary mode, which adds a sense of progression as you earn cash to buy new weapons between missions or upgrade guns you already own. New guns also require different strategies to get the most bang for your buck, like getting close with a flamethrower or sticking back with a rocket launcher. Most weapons also have a cool-down which encourages you to switch up your three slot repertoire and experiment with different combinations. Unfortunately, while it's easy to get hooked on this arcade shooter, Guerrilla Bob's campaign is over just as it gets going. The revenge tale wraps up in less than an hour on easy and the game also repeats much of the same level design and desert backgrounds. However, rafting sequences and night missions help break up the pace, and survival mode definitely adds a few more hours, especially when you bring a friend along to break a high score. While you'll be looking at the same scenery, the presentation is top notch and backgrounds are surprisingly detailed with everything from goofy signs in front of buildings to bullet holes on vehicles. The graphics are vibrant and the hilarious enemy character models, which range from Russian mobsters to terrorists and shady mercenaries, will likely keep you laughing with their lemming charges and silly death animations. But even though Guerrilla Bob is aimed at younger audiences with its cartoon violence, you might want to steer children away from this celebration of violence and cigar smoking. Even adults may be turned off by the Middle East setting which seems to makes light of war and violence, even going so far as to include suicide bombers (albeit portly white guys holding TNT). And while Guerrilla Bob aims to be irreverent, it's not witty or scathing commentary; it's just silly. Overall, despite its repetitive level design and brief campaign, Guerrilla Bob is a lot of fun. Whether you game on your phone or at home, the multiple difficulties, unlockable characters and endless Survival mode will keep you entertained and certainly justifies the price of admission. Younger children could find better role models than Bob: the cigar smoking, warmonger/mercenary, but for teens and adults, the game remains a good looking addition to your smartphone, tablet or PC. Just don't go looking for any meaningful themes or content, this Guerrilla is only in it for the money.